A good friend of mine, and former colleague, came by last week to talk about film in the classroom. Let me give you a little background on our work relationship: “Phil” and I were hired in Carlyle the same year. In our third year, I began dabbling in TPRS and CI based methods and something amazing happened.. Kids started flooding my Spanish classes! As Spanish grew and grew, German enrollment declined! I talked with “Phil” about learning to use TPRS or CI based methods but he learned German in a grammar based classroom and felt like what he was doing was right for his kids. It cost him his job! In the third year of my CI based classes, he only had 3 sign up for German I, the district could not rehire him! Fast forward to two years ago…. After a 4 year break from teaching, Phil found a new job teaching German. The program was shrinking and they were looking for someone to turn it around. He wanted to be the one, and he wanted me to train him to use CI! Today his German program has eclipsed the Spanish program (who had to release a teacher due to declining enrollment!) He is thrilled but is getting a lot of grief about his method from the Spanish teachers! They say that the kids only want to take his class because he just tells stories and shows a lot of films…..
1. Films are alive with culture! My students learn a LOT about the history and culture of Spanish speaking countries through film study. We watch films for background, for comparison, and for interpretation! Used in a clear context, they can have real meaning to students. 2. Films are engaging! If I had students take notes on Archbishop Romero, it would not be as engaging as watching the film Romero together. We can focus on his metamorphosis through the film rather than simply on paper! 4. Films teach language! Nothing has taught me this more than using the series Internado Laguna Negra with my level III and IV classes! The words they learn watching this show appear over and over again in their writing!! 5. Films reach visual learners! So many of our weak readers have trouble creating a movie in their miss when we read together. By adding a film, students can call up images from the film when we read to foster comprehension of the story! I often show a film before a novel so that students have a point of reference as we read! I am in my room today, a school holiday, with my Spanish IV kids. They wanted to come in and watch two episodes of Internado today… On a school holiday…. Film is powerful! In context, with clear goals an purpose, and with plenty of explanation/connections, it can be the most powerful #authres we bring to the classroom!!! Kristy Placido suggested a Spanish 3 unit with a spooky theme. We thought it might be fun to adapt some authentic stories for upper level students through Laurie Clarcq’s Embedded Readings. 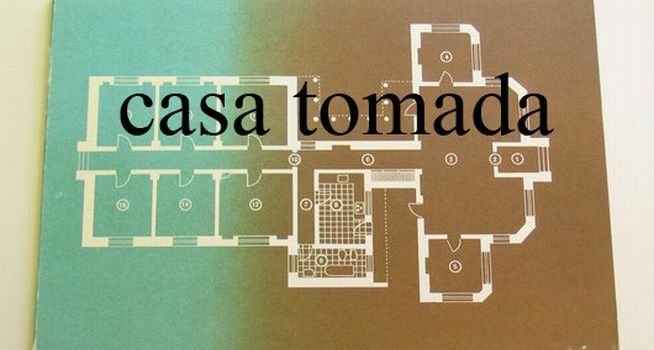 This is my adaptation of the Cortazar story Casa Tomada.